Click here and buy the book from Amazon.com if you think GOOG > $700 is perfectly reasonable. It's a quick, informative, and delightful read. No matter what your political leanings or economic beliefs might be, there is no denying that Galbraith is a brilliant writer. In this humorous and thoughtful book, he traces the investor "herd" mentality from Tulipomania, which gripped Holland in the 1630s, through a variety of events and up through the 1987 stock market debacle--which he accurately predicted. Galbraith analyzes the crashes that resulted from these speculative episodes, and he points out that the "mass escape from sanity by people in pursuit of profit," which, in his opinion, is always the cause, is never blamed. A truly excellent book, this is highly recommended. - C. Christopher Pavek, Putnam, Hayes & Bartlett, Inc. Information Ctr., Washington, D.C. In this thin volume, Galbraith, the noted economist and presidential adviser, serves up a pessimistic view of today's U.S. economy. Drawing on the omnipresent headlines of corporate scandal and greed, Galbraith explains that as the economy suffers, the overall state of American society declines as well. He points to a number of cases of "innocent fraud," or the gap between reality and conventional wisdom. The author bemoans the emphasis on gross domestic production, or GDP, rather than cultural or artistic advances. Companies, not the public, decide what products to make. Galbraith believes that decisions in various corporate arenas are made based on profits, rather than sound business strategies. Furthermore, he says that shareholder meetings, with a few rare exceptions, are pointless because "Shareholders-owners-and their alleged directors in any sizeable enterprise are fully subordinate to the management.... An accepted fraud." He also calls the rapid Internet growth and subsequent bubble another example of fraud as millions of analysts predicted rapid growth for so many companies, but ultimately many employees were laid off. Even more dismaying to Galbraith is the power of the Federal Reserve, which is credited with prompting economic resurgence when, in his view, the institution has limited real power. This brief treatise is a well-written, logical argument about the state of the economy. However, readers may be disappointed because the short concluding chapter offers few realistic solutions. So... I finally got around to finishing Getting Things Done, after having it on my expansive unread-book shelf for ~6 months (what's the emoticon for self-deprecating irony?...). I wish I'd thought to explore the Wikipedia entry on GTD before reading the book, as that would have saved me some time; I still think the book is a worthwhile read, however. Wikipedia also has an entry on GTD software -- an impressive list; clearly the GTD approach has resonated with lots of readers (and software developers). "Some applications (such as Lotus Notes) allow you to file a copy of an e-mail into one of your folders as you send it (with a 'Send and File' button). Others (e.g., Outlook) will simultaneously save only into your universal 'Sent Mail' folder. In the latter case, what seems to work best for many is to copy ('cc' or 'bcc') themselves when they delegate via e-mail, and then to pull that copy into their '@WAITING FOR' folder. (It's relatively easy to program Outlook to automatically send any e-mail that you 'cc' to yourself in a designated folder, which would replicate the process just described.)" Here's my information worker time & attention entropy reduction tip for the day: Allen is wrong -- Outlook does support send-and-share, but it's a multi-step action in Outlook, rather than the single-step action in Notes. With the Facebook platform, only Facebook itself can be a "container" -- "apps" can only run within Facebook itself. In contrast, with Open Social, any social network can be an Open Social container and allow Open Social apps to run within it. If you recall how I previously described the Facebook platform as "a dramatic leap forward for the Internet industry", you'll understand why I think Open Social is the next big leap forward! Most consumers are familiar with do-not-call lists, which are meant to keep telemarketers from phoning them. Soon people will be able to sign up for do-not-track lists, which will help shield their Web surfing habits from the prying eyes of marketers. Such lists will not reduce the number of ads that people see online, but they will prevent advertisers from using their online meanderings to deliver specific ad pitches to them. The Mountain View, Calif., company plans to release later this week a set of technical specifications software developers can use to write Web-based applications that run within a number of different social-network services and also tap into user information. Google says its 12 initial partners for the OpenSocial specification include social networks Hi5 Networks Inc., LinkedIn Corp., Ning Inc., Friendster Inc. and Salesforce.com Inc., and also Oracle Corp., which sell software and Web-based services to businesses. Google says a number of application developers for social networks -- which allow individuals to set up personal Web pages and communicate with friends -- have signed on as well. The partners don't include the biggest U.S. social-networking services, MySpace and closely-held Facebook, setting the stage for a possible standards battle between them and Google. Google Inc. is in advanced talks with two top U.S. cellphone operators, Verizon Wireless and Sprint Nextel Corp., about selling handsets tailored to its new mobile-phone operating system, people familiar with the matter said. Deals with the carriers would represent a major breakthrough for the Internet search giant, which until now has encountered wariness from some quarters of the wireless industry about its mobile-phone plans. Cover Pages: XForms 1.0 Third Edition Published as a W3C Recommendation. W3C has announced the publication of XForms 1.0 (Third Edition) as a W3C Recommendation, signifying that there is significant support for the specification from the Advisory Committee, the W3C Team, W3C Working groups, and the public. Forms are an important part of the Web, and they continue to be the primary means for enabling interactive Web applications. Web applications and electronic commerce solutions have sparked the demand for better Web forms with richer interactions. XForms 1.0 is the response to this demand, and provides a new platform-independent markup language for online interaction between a person (through an XForms Processor) and another agent, usually remote. A new type of memory technology could lead to thumb drives or digital-camera memory cards that store a terabyte of information--more than most hard drives hold today. The first examples of the new technology, which could also slash energy consumption by more than 99 percent, could be on the market within 18 months. Ellison, co-founder and chief executive of giant software company Oracle, currently holds about 74 percent of NetSuite through an affiliate company and family trusts in his son's and daughter's names, and would have had majority control after its IPO, including the right to make key decisions, raising conflict of interest concerns. Under revised terms laid out in Tuesday's filing, Ellison will transfer the 61 percent stake held by affiliate Tako Ventures into the lockbox company, and will lose the ability to appoint directors to the company's board after NetSuite's IPO. But I think they don't quite know which party they're talking about. See this screed where some Javatard says Apple has been spitting in his face because we didn't include Java 6 in Leopard. Or something. So he says he's selling his Mac. His headline is, "So long, Apple. The party's over." Well he's right about one thing. The party is over -- the Java party, that is. Glad to see the Javatards have finally figured that out. Word is they're co-sponsoring a support group with Lotus Notes developers. Fun bunch. The Java platform is divided into four main platforms: Java Platform, Standard Edition (Java SE), Java Platform, Enterprise Edition (Java EE), Java Platform, Micro Edition (Java ME), and Java Card. In this Application Platform Strategies overview, Senior Analyst Richard Monson-Haefel finds that Java Card and Java SE are strong leaders in their respective markets with longevity; Java ME is also a leader in its market, but it suffers from platform fragmentation; Java EE has grown far too complex and does not have a viable future as it is currently defined. Depending on BEA's next moves, it may be lucky to see $17/share. Within the next two weeks, Google is expected to announce advanced software and services that would allow handset makers to bring Google-powered phones to market by the middle of next year, people familiar with the situation say. In recent months Google has approached several U.S. and foreign handset manufacturers about the idea of building phones tailored to Google software, with Taiwan's HTC Corp. and South Korea's LG Electronics Inc. mentioned in the industry as potential contenders. Google is also seeking partnerships with wireless operators. In the U.S., it has the most traction with Deutsche Telekom AG's T-Mobile USA, while in Europe it is pursuing relationships with France Télécom's Orange SA and Hutchison Whampoa Ltd.'s 3 U.K., people familiar with the matter say. A Google spokeswoman declined to comment. The Google-powered phones are expected to wrap together several Google applications -- among them, its search engine, Google Maps, YouTube and Gmail email -- that have already made their way onto some mobile devices. The most radical element of the plan, though, is Google's push to make the phones' software "open" right down to the operating system, the layer that controls applications and interacts with the hardware. That means independent software developers would get access to the tools they need to build additional phone features. Adding a twist to a high-stakes conflict over document formats, some advocates for OpenDocument, or ODF, are abandoning the standard in favor of the World Wide Web Consortium's Compound Document Formats standard. The reason? Technical limitations in sharing ODF files with Microsoft Office applications. "We can't meet our market requirements with OpenDocument," said Gary Edwards who started the OpenDocument Foundation last year. "The truth is OpenDocument was never designed to meet market requirements." I want this type of equipment for my laptop. I also want it to draw power from the laptop; the battery in the current Myvu "universal" edition only lasts for 4 hours. 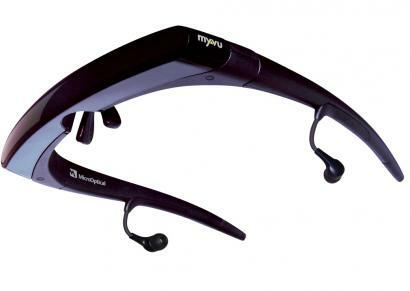 You wear the Solo Plus Edition (about $200 at myvu.com) as you would a pair of glasses, and plug its stereo headphones into each ear. The device's two tiny lenses are positioned to create the illusion of a single image in your field of view. Shai Agassi, a Silicon Valley technologist who was in competition to become chief executive of SAP, one of the world’s largest software companies, has re-emerged with a grand plan to reinvent the world’s automobile industry around battery-powered all-electric cars. In a statement yesterday, Oracle said BEA shareholders "should not assume that Oracle will renew its $17 per share offer in the future. Over time many things can change: BEA's business might materially weaken, the stock market can fall further from its recent record highs, or Oracle may have committed its capital elsewhere." Oracle also invited shareholders to take action against BEA's board. "If the BEA shareholders are unhappy with the behavior of the BEA board it is up to those shareholders, not Oracle, to take the appropriate action," it said. Twine is a website where people can dump information that's important to them, from strings of e-mails to YouTube videos. Or, if a user prefers, Twine can automatically collect all the Web pages she visited, e-mails she sent and received, and so on. Once Twine has some information, it starts to analyze it and automatically sort it into categories that include the people involved, concepts discussed, and places, organizations, and companies. This way, when a user is searching for something, she can have quick access to related information about it. Twine also uses elements of social networking so that a user has access to information collected by others in her network. All this creates a sort of "collective intelligence," says Nova Spivack, CEO and founder of Radar Networks. The billionaire investor Carl C. Icahn has sued BEA Systems, the software maker that spurned a $6.7 billion offer from Oracle, demanding that the company hold an annual meeting and permit shareholders to vote on a sale. Mr. Icahn, BEA’s largest shareholder, said Friday that the company should put itself up for auction. The lawsuit asks for BEA, which is seeking an offer of more than $8 billion, to hold an annual meeting by Nov. 30. Mr Zuckerberg and Facebook's other early investors, of course, have carried off the biggest victory. Mr Zuckerberg is now worth some $3 billion on paper. Google will not suffer much. Its seemingly endless rise continues. Its own social network, Orkut, does well in emerging markets and is about to get a revamp that may make it a stronger rival to Facebook. It is Google's and Microsoft's other rival, Yahoo!, which now looks really forlorn. It has been outmanoeuvred by everybody in the acquisition game. It keeps losing to Google in search and advertising, and unlike Microsoft it has no software-licence revenues to fall back on. Last week it shut down its own social network, Yahoo 360°, and hardly anybody noticed. Icahn, who holds a significant stake in BEA, said in a letter to BEA's board Friday that, "I view your public declaration of a $21 per share 'take it or leave it' price as a management entrenchment tactic, not a negotiating technique." Icahn suggested the board hold an open auction process for potential buyers, including Oracle, and allow BEA shareholders to "to accept or reject the proposal made by the highest bidder." Icahn also said he is commencing a lawsuit aimed at preventing BEA's board from taking "any action that would dilute voting by issuing stock, entrench management or derail a potential sale." Check it out at this page. The HP Mediasmart Server will be available to buy in the coming weeks - HP have kicked off their marketing with an online demo of the server which outlines its features and benefits in detail. Alongside the recent Windows Home Server minisite at microsoft.com, it’s certainly the most detailed (and glossiest!) overview we’ve seen on WHS and if you’re in the market for the HP Mediasmart, it makes a pretty compelling case. I think Windows Home Server is going to be a very high-volume product. Extrapolating Facebook's true worth from Microsoft's investment is a ridiculous exercise, for two main reasons. First, the investment is part of a broader deal, the details of which are unknown. Clearly, Facebook needs cash to support its growth, and the cash payment was a price Microsoft had to pay to nail down the partnership. It has to be seen in that light, not as a market-cap marker. Second, and more important, Microsoft's investment is not financial but strategic. The company is currently engaged in a multi-front competitive battle under conditions of great uncertainty. Facebook forms one of the fronts, and partnering with the company is far more about gaining future strategic options and blocking the advance of a competitor (Google) than about making a financial gain through the appreciation of Facebook stock. Microsoft, in other words, is about as far from being a dispassionate investor as you can get. Its investment, in isolation, tells us very little about the true worth of Facebook. When Did A Fake Blogger Become a Reliable Source? There are not one, but two stories on Techmeme this morning broken by Fake Steve Jobs , a.k.a. Forbes' Daniel Lyons. Both were repeated on a number of blogs. Yes, we know who Fake Steve is now, and yes he's a credible reporter working for a respected publication, but bear in mind that these stories were reported with no sources and on the blog of a fictional character. Yet, they were taken at face value by a number of prominent bloggers. Embattled SCO Group is offering the bankruptcy court a deal it could be hard to refuse. The company has received an offer of $36 million from JGD Management for its business and intellectual property. JGD Management, a current debtor of SCO, is an investing arm of York Capital Management, which owned more than 91,000 shares of SCO stock from March 2005 to September 2006. In after-hours trading today, investors bid up Microsoft’s shares by 12 percent, to nearly $36. That added about $30 billion to its market value. Microsoft hasn’t seen that high a stock price since 2001. Nonetheless, a day after we marveled at the $15 billion value placed on the tiny business that is Facebook, this is a reminder that Microsoft, even if it is not so fashionable, has a business that makes real dollars and a lot of them. The world's largest software company is now working to adapt a basic version of Windows XP so it is compatible with the nonprofit One Laptop Per Child Foundation's small green- and-white XO laptop. "We're spending a non-trivial amount of money on it," Microsoft Corporate Vice President Will Poole said in an interview on Thursday. Yesterday’s earnings report illustrates how far Microsoft has to go. Its online services unit grew 25 percent, to $671 million, but its revenue amounted to less than 6 percent of Microsoft’s quarterly sales. And the quarterly loss from online services more than doubled, to $264 million, from the loss of $102 million in the quarter a year earlier. But yesterday’s financial results also underline the growth and profitability of Microsoft’s mainstay personal computer software businesses. That gives Microsoft the financial firepower — it had $21.5 billion cash at the end of the quarter — needed to pour money into new fields for the long term, making moves like its $240 million investment on Wednesday in the social networking start-up Facebook. Oracle Corp. has delivered a letter to the board of directors of BEA Systems Inc. rejecting BEA's proposed acquisition price of $21 per share as "an impossibly high price for Oracle or any other potential acquirer," pointing out that no other potential buyers have come forward. "Apparently no other companies think that BEA is worth $17 per share, let alone $21 per share," Oracle President Charles Phillips wrote in the letter. "Accordingly, we repeat our proposal to purchase BEA at $17 per share, a price that we are unwilling to increase." For comparison, incidentally, Adobe is currently worth $27B. BEA Systems Inc. said it is willing to negotiate with potential acquirers, including Oracle Corp., if they are willing to pony up $21 a share, or $8.2 billion. That compares with the $17 a share, or $6.7 billion takeover offer, Oracle made two weeks ago. Oracle said Tuesday that the offer will expire at 8 p.m. EDT Sunday if BEA doesn't agree to a deal or put the bid to a shareholder vote. EMC Corp., the top maker of data-storage computers, owns 86 percent of VMware, which it acquired in 2004. EMC used the IPO to provide stock options to pay for Silicon Valley talent, construction of VMware's headquarters and product development. A quick calculation suggests the market thus values the non-VMW part of EMC at ~$14B at the moment. Google has been expanding in a myriad new ways, but its core search and contextual advertising business continues to account for the overwhelming majority of the company’s business. If the analysts were wondering what’s Google’s second act is likely to be, they got the answer early: more of Google’s first act. “The next multi-billion dollar opportunity is really our core business of search,” Mr. Kordestani said. The panelists emphasized that point, talking about the “head room” that is left in every one of Google’s existing businesses, including search ads, the company’s nascent display ads business and even enterprise sales. Adobe gets two things with Virtual Ubiquity. One is a proof point of the virtue of developing Web applications with its tools. The other is a document creation tool that could be integrated with other Adobe products like the Connect Web conferencing system, or could automatically export documents to Adobe’s PDF format. Buzzword isn’t the first Web-based word processor—at least half-a-dozen others are out there, including Writely (now part of Google Docs). But it just might be the slickest. “We were asking users to trust their documents to a small startup, and we now have a trusted and well-respected brand name,” says Treitman. That may create a lot more buzz around Buzzword. Though VMware shares have been listed on the New York Stock Exchange for only about two months, the company's market capitalization is already $38.8 billion. That makes it the fifth-most-valuable business software company after Microsoft Corp., Oracle Corp., Germany's SAP AG and Adobe Systems Inc.
Google Inc. and IBM Corp. are not included because the technology industry considers Google a consumer search company and IBM a diversified consulting company, although they create software for corporate clients. Google co-founder Sergey Brin told reporters at the end of the day: "Occasionally we've lost one here, one there...Some of our competitors might be willing to spend very large amounts of money...and we're really interested in doing sustainable economic deals, so we would rather not participate in those sorts of transactions. But we definitely wish those companies well." "I'm on the board of Apple. I'm using the iPhone," said Schmidt, holding up his phone to show reporters. "We have a policy of not talking about future products." What Schmidt wanted to talk about was Google's hosted Apps business, which puts it in competition with Microsoft's desktop applications. "People always compare us to the market leader. We're not trying to solve that problem; we're trying to solve a different problem," to offer the ability for people to collaborate on documents, Schmidt told analysts. Earlier in the day, Google Internet evangelist Vint Cerf talked about plans for an Interplanetary Backbone and the company gave some demonstrations of iGoogle, Google Maps and Gmail. Apple's new Macintosh operating system ships today. Visually stunning, OS 10.5--a.k.a. Leopard--is fast and stable, and it features a consistent set of powerful file-management tools familiar to anyone who has ever used iTunes. And unlike Microsoft Windows, which seems to grind slower with each successive release, OS 10.5 feels faster than 10.4 on the same hardware--provided that you have sufficient memory. Facebook and Microsoft Corp. today announced that the two companies would expand their advertising partnership and that Microsoft will take a $240 million equity stake in Facebook’s next round of financing at a $15 billion valuation. Under the expanded strategic alliance, Microsoft will be the exclusive third-party advertising platform partner for Facebook, and will begin to sell advertising for Facebook internationally in addition to the United States. Facebook and Microsoft Expand Strategic Alliance: Two companies expand advertising deal to cover international markets, Microsoft to take equity stake in Facebook. Given VMware's rise, EMC's lower stock price puzzles some analysts. EMC's shares fell 25 cents, or 1.1 percent, to $23.11. The company also reports earnings this week. Even if VMware's shares are only worth half their current price, EMC is an attractive stock, said L.R. Burtschy's Meeks. While his fund owns neither stock, he's trying to persuade the family to buy EMC. It's going to be pretty amusing if VMW's mkt cap surpasses EMC's, since the latter is majority owner of the former. BEA Systems Inc. has told Oracle Corp. that the two companies can still make a deal -- just not the one on the table. Oracle released a statement today saying that BEA's board of directors had officially turned down its offer to buy the company. It set a deadline of Sunday at 5 p.m. Pacific time for BEA to accept the $17-per-share bid. But several hours later, BEA fired back its own missive in the form of a letter from William Klein, vice president of planning and development, to Oracle President Charles Phillips. In the letter, Klein characterized Oracle's offer as too low but made it clear BEA is not against being acquired for the right price. "BEA is worth significantly more than $17 to Oracle, to others, and most importantly to BEA shareholders," the letter said. "BEA's Board has not indicated that it would be opposed to a transaction that appropriately reflects BEA's value, reached through a reasonable process." The devastating wildfires in Southern California have burned more than 373,000 acres of land; 350,000 homes have been evacuated. Lots of people have pulled together to make maps with information about the fires, including the burn zones, evacuation alerts, evacuation centers, safe areas, and closed roads. Here's a list of some of the most widely-used fire maps that our Google Maps team is aware of. We hope everyone is safe and that relief comes soon. Indeed, Apple is now the fourth most valuable technology company, after Cisco ($189 billion), Google ($208 billion), and Microsoft ($290 billion). Apple, interestingly, has something in common with these other companies. They all draw their power from software. Microsoft sells software in a box. Google delivers software online. Cisco, like Apple, delivers software embedded in devices, which it largely contracts to others to make. But there is a key difference, too. The other three have established dominant positions in their markets, which fends off rivals and keeps margins high. Apple is a distant No. 3 in PCs. It dominates personal music players, but it has a much more modest share if you define the consumer electronics market more broadly. The other lesson is how the forces of supply and demand are made far stronger and spread around the world by the Internet. The resale value of World Series tickets is near $1,000 for the least expensive tickets, and more than $5,000 for choice seats. That creates real incentives for people to get into the system, whatever the means – and wherever they are located. Major League Baseball teams, which once frowned on scalping, now are active participants in a secondary market through sites like Stubhub. It’s a market that is driving at least some of the millions of hits that cost the Rockies the first loss of the World Series [i.e., overwhelmed their web site]. After the record-breaking quarter it posted yesterday, Apple is today the most valuable computer-maker in the world. Its market capitalization now stands at nearly $162 billion, $6 billion more than that of industry heavyweight IBM. In fact, its market cap is the fourth largest among technology companies, lagging behind only Cisco ($189 billion), Google ($208 billion) and Microsoft ($290 billion). Which is obviously great news for Apple shareholders, as John Murrell notes over at my old stomping grounds, Good Morning Silicon Valley: “… while Google-watchers go gaga over its soaring share price, note that an investor who bought Apple on the same day Google stock debuted in 2004 would have, as of the close of market yesterday, made 40 percent more than if the same money had been put into the search sovereign’s shares. Q: Beastmaster and Monkey Boy [FSJ's names for Bill Gates and Steve Ballmer]: What happens if you meet them? A: I don't think they'll be there. Q: Are you going to refer to them by their sobriquets? A: Not to their face. Maybe. I doubt they'll come. I hope they'll have more important things to do. I interviewed Ballmer a couple of years ago; he's a great guy. He's totally down to earth. There's a Fake Ballmer Blog right now; it's not very funny. ... For one of these parody blogs to work you have to have someone who presents one face to the world and is another way. Hillary Clinton would be a great parody blog. Steve Jobs with his Zen thing, but he's really a monster behind it. Dave Thomas, president of media client services for Nielsen, said that discussions were under way between his company and Google to expand the partnership to the Internet and other media. “People are trying to get a better idea of exposure to the commercials, not to rely on program audiences, which was the coin of the realm as it related to TV time,” Mr. Thomas said. The battle for BEA Systems seems far from over despite Oracle's warning that it will walk away from its $6.7 billion takeover offer if BEA doesn't agree to a deal in less than a week. BEA insisted the company is "worth significantly more" than Oracle's bid of $17 a share. Shares in BEA have been trading above $17 since the offer was made public earlier this month, suggesting shareholders believe a higher offer is in the wings. The stock closed at $17.87, down 3.9% but above the bid price. Specifically, IBM - which collects more than $1 billion in patent royalties every year - describes a new process for licensing patents. Instead of smaller companies licensing technologies from patent holders like IBM in a plodding, one-by-one manner, IBM envisions a more dynamic system with "floating privileges," in which patents could be licensed quickly, as needed. The application says this floating privilege, once purchased, could be activated by a patent-infringement lawsuit. In other words, companies would buy the right to use a patent portfolio like IBM's as a legal shield for themselves - "just like purchasing a fire insurance policy," IBM's application contends. These notes--terse, obscure, and endlessly self-referential--are all examples of a new phenomenon in social media called "microblogs": short electronic posts, sent to friends or to a more general community, that deliver some information about the sender. Sending microblogs broadcasts, "I am here!" Reading microblogs satisfies the craving of many people to know the smallest details of the lives of people in whom they are interested. Already, new-media intellectuals have coined a term to describe the new social behavior they say microblogging encourages: they talk of "presence," a shorthand for the idea that by using such tools, we can enjoy an "always on" virtual omnipresence. Oracle Corp. told BEA Systems Inc. its $6.7 billion takeover offer will expire Sunday if the software company doesn't agree to a deal or put the bid to a shareholder vote. The offer, made public 10 days ago, values BEA at $17 a share, a 25% premium to the company's share price the day before Oracle disclosed the bid. At the time, BEA rebuffed the offer, saying it significantly undervalued the business software provider. AAPL: 186.05 +11.69 (6.70%) - Apple Inc. Think about the brand power and development savvy that Microsoft controls. Imagine a world where an RIA version of Office runs on top of Silverlight for Windows, Mac and PC users with your data being stored on Microsoft’s servers. The reputation that Microsoft has in the business and enterprise world gives them a huge head start in rolling out RIAs that can infiltrate those verticals. I don’t think anyone has done a good job of selling the RIA mantra to the business application world. We’re [Adobe] making inroads, but there aren’t a lot of great examples of business-class rich internet applications that have gotten traction. Microsoft can close that loop better than most while giving flexibility in an increasingly OS-agnostic world. I was mistaken in a weekend post -- Adobe Flash Player download does indeed include Google Toolbar by default. It’s been a while since Microsoft signed up any more Linux distro vendors to participate as patent-protection partners. But on October 22, the Redmondians announced they’ve added TurboLinux to the fold. Microsoft’s deal with TurboLinux — like the interoperability/technology partnership arrangements it has cemented with Novell, Linspire and Xandros — has several components. In a bid to woo more of the casual gamers flocking to the Nintendo Wii, Microsoft is repackaging its lowest-priced version of the Xbox 360 with games, a wireless controller and a high-definition cable. The Xbox 360 Arcade, the company announced Monday, comes with five casual games, including "Pac-Man Championship Edition" and "Uno," as well as 256 megabytes of storage. It sells for $280, the same price as the stripped-down Xbox 360 Core system, which includes only a wired controller and is being phased out. Apple reported earnings on Monday that leapt ahead of analysts’ already optimistic expectations on record sales of its Macintosh computers. The numbers showed that the company was slowly climbing back into the league of the dominant personal computer makers, Hewlett-Packard and Dell. The market research firm Dataquest estimated last week that Apple sold 1.3 million computers in the United States, and IDC put the figure at 1.1 million. In the same period, Dell sold 5 million computers and H.P. sold 4.3 million in the United States, according to the IDC report. Two new questions arise, courtesy of the latest advancement in cellphone technology: Do you want your friends, family, or colleagues to know where you are at any given time? And do you want to know where they are? Obvious benefits come to mind. Parents can take advantage of the Global Positioning System chips embedded in many cellphones to track the whereabouts of their phone-toting children. And for teenagers and 20-somethings, who are fond of sharing their comings and goings on the Internet, youth-oriented services like Loopt and Buddy Beacon are a natural next step. Flash memory maker SanDisk Corp. on Monday will debut an online video service and a USB flash drive that can carry television programs and videos from a computer for playback on TVs. The Sansa TakeTV video player -- an ensemble of an oversized USB drive, remote control and a small dock that connects to a TV -- and its accompanying video service, Fanfare, marks the latest attempt by a company looking to bridge content between the PC and the television. Legal experts said the judgment came down so firmly against Microsoft that the company had little room to mount an appeal. Instead, Microsoft sought a deal. Under the agreement, Microsoft will license all of its intellectual property, except patents, necessary for competitors to work with a version of Windows used on business servers. Competitors will now pay only a one-time fee for the license of 10,000 euros, rather than royalties. If they believe they need to license patents from Microsoft, Microsoft is required to do so at the rate of 0.4% of the competitors' revenue from the product, well below the 5.95% rate originally suggested by Microsoft. Mrs. Kroes, for her part, stopped the clock on daily fines of up to €3 million per day against Microsoft and declared the U.S. software giant was – at least for now -- in Europe's good graces. "As of today, the major issues concerning compliance have been resolved," she said. In the YouTube era, live webcasts are spreading to some unlikely events, from a middle-school graduation in suburban Chicago to the International Barbershop Competition in Calgary, Alberta. But weddings held in exotic locales seem ready-made for the small screen, as wedcasts provide a way for couples to tie the knot at a Florida resort or on a mountaintop in Hawaii while including friends and loved ones who cannot make the trip. I use (Google) Blogger for my blogging service provider and Microsoft Windows Live Writer for creating/editing blog posts. I'm happy with both, in part because both work well for my needs and are free. In case the image format gets munged on your client, the text above: "In order to upload images to Blogger blogs, you must go to the Picasa Web Albums homepage, sign in as [my Google/Gmail id clipped; I receive enough spam these days -- for fun, I'm waiting to see if all the undeleted spam I've accumulated will someday exceed my Gmail space allocation...], and agree to the Terms and Conditions. Would you like to go to the Picasa Web Albums homepage now?" Well, that's a bit more than I bargained for, but it'd be pretty handy to be able to upload images in Blogger posts, so I'll uncheck a bunch of the options (I suppose they might have auto-detected that Google is already my default search engine in IE, BTW...) to avoid desktop clutter, and be on my way. I'll carefully read the 4,221-word (~13-page, copied/pasted into Word) "Google Terms of Service" agreement, which for some unknown reason I had to click through twice, and presto! Now I can easily upload images, using Microsoft Windows Live Writer, to my Google/Blogger blog. And yes, it was Microsoft (the Windows Live Writer team, in this case) that tried to make it more convenient for me to use images with Google's blogging service, thus providing Google with an opportunity to perform steps 3 - 5 above. So, if I have a few hundred megabytes of free disk space and need yet another productivity application suite, I can conveniently download OpenOffice.org 2.3 (which, coincidentally, requires a Java runtime environment). Or I could download Google Pack, which includes Sun's enhanced version of OpenOffice.org, StarOffice (list price $70, but available at no cost with Google Pack). So... by default, when I accept the free Java runtime environment update, I also install Google Toolbar and Google Desktop (i.e., the checkboxes are clicked by default). I'd like to know how much Google pays Sun for this; I'd also like to know how much Google pays Adobe for similar "offers" now included with Adobe player and product installation routines (although, IIRC, at least Adobe has an opt-in model). It's all very effective for Google, in any case -- anyone who has used a Java runtime environment for any reason, and who doesn't read the fine print when installing the update, will contribute to Google's installed base numbers (whether or not they actually ever use Google Toolbar or Google Desktop, in this scenario). First, a recap: Google has been building a mobile-phone team ever since the acquisition of mobile-gadget developer Android in 2005. Andy Rubin, Android's founder, is leading the project's engineering team. He co-founded Danger, Inc., the company behind T-Mobile's popular Sidekick line of Internet-friendly smart phones. Rich Miner, in Google's Boston office, is leading the business side of the effort, sources say. Meanwhile, Google co-founder Larry Page is providing high-level support for the project. The phone promises to fuse open-source software with Google's applications on a high-end handset. Rubin's team is building custom mobile-phone software atop the free Linux operating system that will bind the phone tightly to Google's online applications and advertising services, sources say. Software from another Google acquisition, Skia, will put a slick user interface on the package. Finally, Google will build all that software into a smart phone built by Taiwanese handset specialist HTC, according to a source familiar with the matter. Google's effort, I'm told, is being led by Joe Kraus, the founder of Excite. Though he is as Web 2.0 savvy as they come, I think Google's plan may be too little too late. Everyone these days is opening up his network - even MySpace. Besides, there's no compelling reason for users to leave Facebook now. The developers will stay as long as they can reach a mass audience there. Google's trying to fix something that isn't broken - just as Microsoft has been doing for years with search and IBM tried to do with operating systems for PCs. Maybe Google should stick to organizing the world's information, and let this little mouse roar. The Joe Kraus reference is the closest to a JotSpot tangent I've seen in many months. It has now been almost a year since Google acquired JotSpot (of which Kraus was co-founder and CEO), and it seems to have disappeared without a trace. Timely BusinessWeek snapshot; start with page 1 of the article, which also includes a video interview with Michael Dell. I contend that this marks a fundamental shift in the relationship of customers with companies. Dell and its customers are collaborating on new forms of content and marketing, but note that they are doing this without the help of media and marketing companies. Michael Dell predicts that customer relationships will "continue to be more intimate." He even speaks of "co-creation of products and services," a radical notion from a giant manufacturer. "I'm sure there's a lot of things that I can't even imagine, but our customers can imagine," Dell says, still sounding very bloggish. "A company this size is not going to be about a couple of people coming up with ideas. It's going to be about millions of people and harnessing the power of those ideas." Once you can hear them. The sad tale of how Palm got into such a pickle is too complicated for this column. But the company made its own problems much worse by devoting scarce resources to the development of a laptop-like Treo "companion" called Foleo. The project was killed in September, just a couple of weeks before the expected launch. Partly as a consequence, Palm now says a new version of its software, based on the solid and modern Linux operating system, will not be available until the end of next year. Why does this matter? Because for all its faults, Palm still offers the simplest and most intuitive user interface and the best integration between PDA and phone functions of any smartphone. That includes Apple's (AAPL ) iPhone, which has a great Web browser but lacks a simple way to look up contacts. The disappearance of Palm OS phones would be a real loss. In the end, however, a great user interface does consumers no good if its underlying platform is unsound. Facebook might nonetheless be suited for other sorts of marketing. Reuben Steiger, the founder of Millions of Us, a marketing agency for social networks and virtual worlds, says that brands need to design “experiences” that use the social graph to engage groups of friends. If a wrestling association, say, wants to drum up ticket sales for an upcoming bout, it could build a widget that turns users into wrestlers and lets them fight bad guys and win gifts, while making them aware of the brand and the match. But that possibility hardly justifies the sorts of valuations bandied around for Facebook and other social networks. Such valuations, indeed, may reflect a misunderstanding of the social graph. For bigger companies such as Google, the graph is simply the web of links among its many users. It can be used to make existing services more useful. But Google increasingly views such utilities as “features, not products,” says Sergey Brin, its co-founder. Facebook, like many hot start-ups in Silicon Valley, has some fantastic features, but maybe not much more. It'll be interesting to see if it was a one-time bump for Xbox sales. The success of Halo 3, which is exclusive to Microsoft’s Xbox 360, appears to have driven sales of that console. According to NPD, Microsoft sold 528,000 360s, compared to 500,001 Nintendo Wiis and 119,000 PlayStation 3s. And the PlayStation 3, well, it has settled into a comfortable third place among the next-generation platforms. A price cut announced this week may spur sales over the holiday season, but you could imagine that the curriculum makers at Harvard Business School may eventually make a case study of Sony’s inability to maintain its leadership in the console wars. The interference, which The Associated Press (AP) confirmed through nationwide tests, is the most drastic example yet of data discrimination by a U.S. Internet service provider (ISP). It involves company computers masquerading as those of its users. If widely applied by other ISPs, the technology Comcast is using would be a crippling blow to the BitTorrent, eDonkey and Gnutella file-sharing networks. While these are mainly known as sources of copyrighted music, software and movies, BitTorrent in particular is emerging as a legitimate tool for quickly disseminating legal content. APPLE versus Microsoft, Informix versus Oracle, Netscape versus Microsoft. The history of commercial software can be written as a succession of epic battles for dominance of key markets. Now the industry is in the midst of another: America's Oracle is battling against Germany's SAP in the market for enterprise applications, the software that big companies use to run their businesses. I'm usually in sync with Economist analysis, but in this case (the article continues with Oracle/SAP details) I think they overlooked an important dimension: Oracle + BEA is more about Oracle versus Microsoft and Oracle versus IBM than it is about Oracle versus SAP, imho. Already the Internet search leader, Google picked up more bragging rights Thursday when it surpassed Cisco Systems as Silicon Valley's most valuable company. Microsoft, which started when Google co-founders Larry Page and Sergey Brin were still toddlers, is now the only high-tech company worth more than the Internet search leader. The fast pace of hiring at the search giant is the one concern Jordan Rohan, an analyst at RBC Capital Markets, mentioned in an interview with CNET News.com after the Google earnings call. "Half the company has been hired in the last 12 months. That's chaotic," he says. "The new employees find it difficult to figure out how to get things done. It's not a normal company." The results show that Google is growing roughly twice as fast as the overall online advertising market, which itself is booming, and that it is expanding far more quickly than any large Internet company. Surprisingly, Google, which this year had promised to slow its rate of hiring, in part to allay investor worries about rising expenses, added 2,130 employees this quarter, more than in previous quarters, to end the period with 15,916 employees. Google executives said that about 1,000 of the new hires were recent college graduates, many of whom had accepted offers earlier in the year and began working in the quarter. About 300 more workers were added when Google completed the acquisition of the e-mail manager Postini. Look at Schmidt's background. He went pretty much straight from academia to becoming an early employee of Sun Microsystems, where he grew up with the company and became a star. Then Schmidt went to Novell, an established and dysfunctional company in crisis, and failed miserably. Now he's at Google and again a star. What can we learn from these earlier experiences that will help us predict what comes next? Plenty. Eric Schmidt succeeded at Sun because everyone else there came from a similar background. Schmidt established himself as the company was establishing itself, so he helped to form the culture. He left Sun ostensibly because the Novell opportunity came up, but his willingness to leave probably says something about Sun, which was at a point where it, too, was starting to struggle a bit. Sun seemed on top of the world in 1997 when Schmidt left, but everyone at the top knew the company had been saved by the dot-com boom and that it was luck more than ability. Schmidt wanted to go someplace where he'd finally be the one in control and logic could prevail once more. Silly him, he chose Provo. News Corp. will probably end subscription fees at WSJ.com and will open the MySpace social-networking website to developers in a push to add readers and advertisers, chairman Rupert Murdoch said. A decision on WSJ.com will be made by year-end, Murdoch said yesterday in an interview at the Web 2.0 conference in San Francisco. MySpace plans to open itself to outside developers in the next two months, the site's chief, Chris DeWolfe, said. "Big screens, touch, ink, speech, that's something that I think, along with cloud computing, is the next big change in how we think about software," Gates told CNET News.com on Tuesday. (Cloud computing is the notion that many of the computing tasks handled by individual computers today will instead be tackled by servers in huge data centers connected over the Internet.) "Ray Ozzie is driving our cloud computing stuff...Some of the natural interface stuff, I think he and Steve (Ballmer) will ask me to sort of keep the energy and vision alive there." As ideas go, they don't come much bigger: Digitize the accumulated wisdom of humankind, catalogue it, and offer it for free on the Internet in seven languages. The first phase of that simple yet outlandishly ambitious dream is about a year away from being realized, according to a group of international librarians, computer technicians and U.N. officials who unveiled a prototype for the project, called the World Digital Library, in Paris on Wednesday. Its creators see it as the ultimate multilingual, multicultural tool for researching and retrieving information about knowledge and creativity from any era or place. The WDL Web site ( http://www.worlddigitallibrary.org) will provide access to original documents, films, maps, photographs, manuscripts, musical scores and recordings, architectural drawings and other primary resources through a variety of search methods. The nation's largest consumer electronics chain says it has pulled all analog televisions off store shelves. Flat panel and high-definition screens have taken their place. Beginning in February 2009, broadcasters plan to stop transmitting analog signals, although people with older sets can still get programming via special converter boxes, set-top box or direct satellite. Weirdly, the "First Look" article doesn't include pictures, but I found a picture at this site and you can find several purported screen shots here. Sales of portable computers drove much of the 15.5 percent increase in global PC shipments from July through September, especially in Europe, according to research firm IDC, based in Framingham, Mass. Having Google manage my personal health info? Not a laughing matter, imho. Beyond that, Mayer had little else to offer but a schtick-in-need-of-a-laugh-track “Top 10 List of Things You Might See From Google Health.” Among them, Google paternity search, Viagra spam for Gmail users who truly need it, and an “I’m feeling yucky” button. Price: You can get a bargain-basement computer for under $400. But, for a versatile Vista PC with Home Premium, two gigabytes of memory, discrete video, a large hard disk and a dual-core processor, you should expect to spend $800 or more. Technology Review: What Is He Doing?